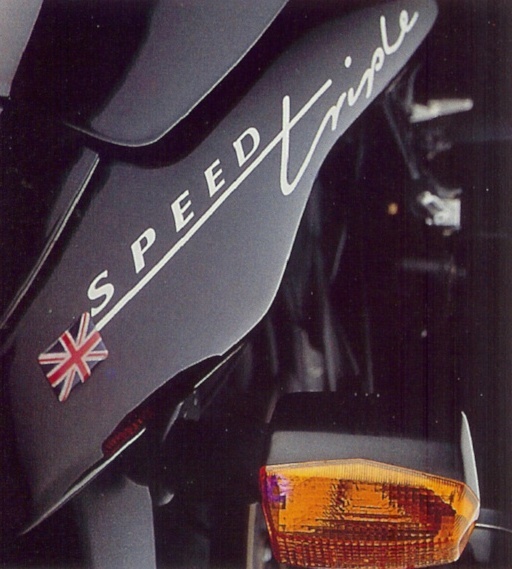 This page houses, for archive purpose only, the information on the Speed Triple from the respective years official brochure. 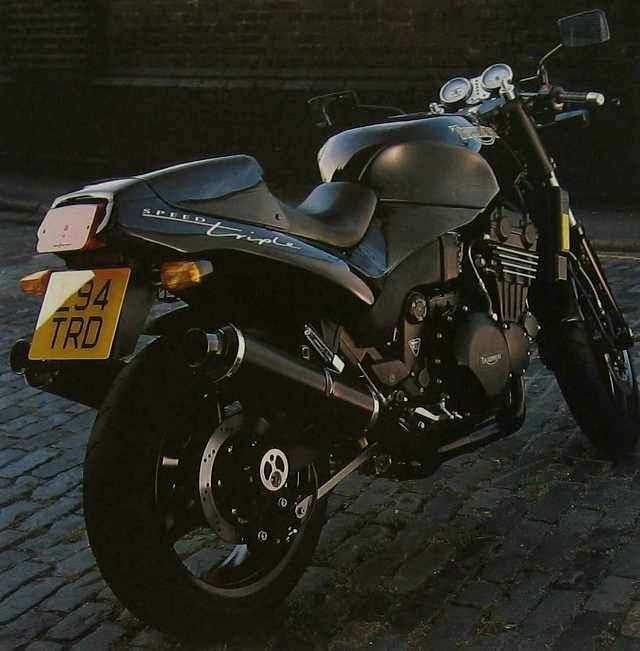 Enjoy reminiscing back to time when Triumph brochures cost you a couple of bob but where well worth it. One look at this bike and you’re left in no doubt. 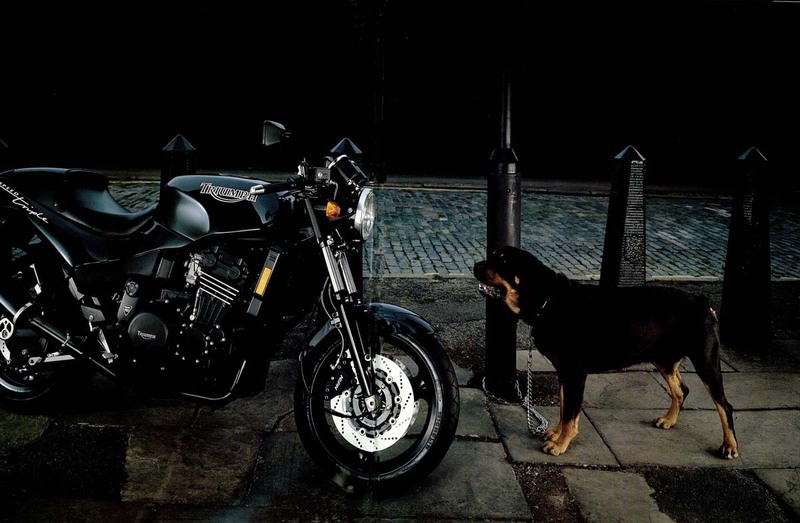 Mean, with no frills – it’s a modern-day cafe-racer. Except that no cafe-racer ever looked like this. 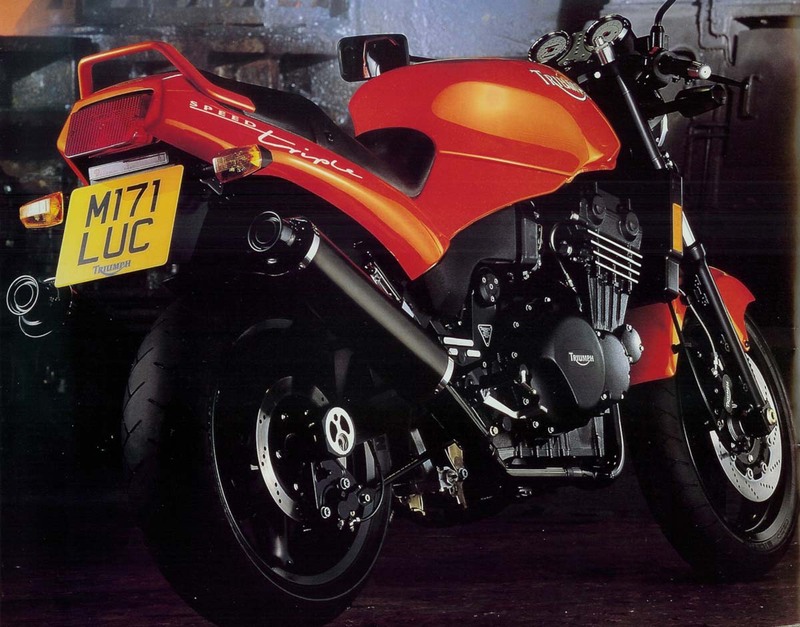 Just gaze over the no-nonsense lines of this muscled streetfighter, its tough good looks flanked by twin upswept exhausts and a ‘clip-on’ riding position. Even standing still, the Speed Triple looks as if it’s straining at the leash. This is motorcycling in the original mould. 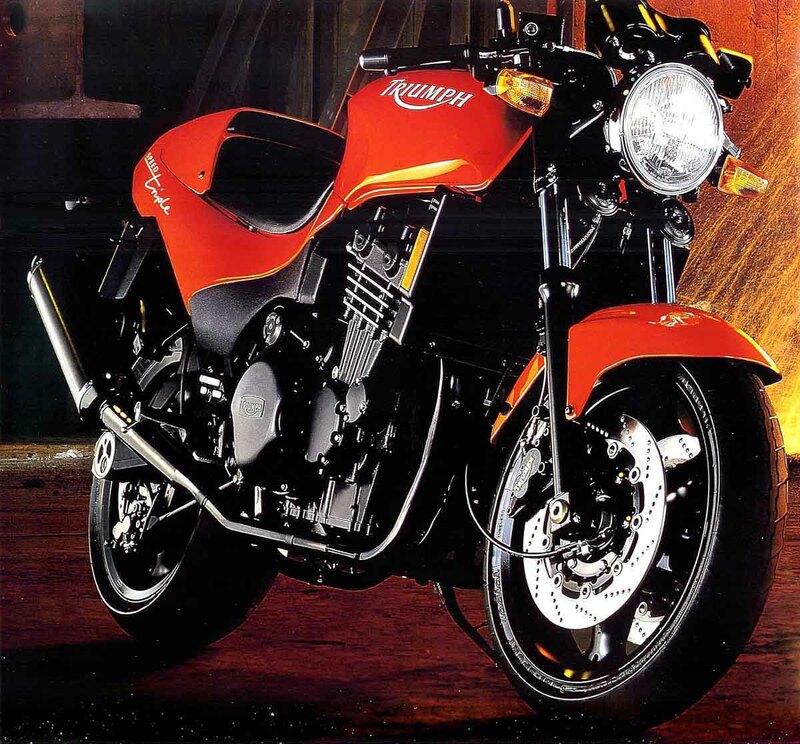 A rorty engine, superb brakes and sure-footed handling – plus a massive rear tyre that leaves you in no doubt of the purpose for which this Triumph was built. performance * – you can fully adjust front and rear suspension to match. The handlebar levers can also be set in four different positions. The there’s that tyre. The rear is a massive 180/55 section on a 5.5″ 3-spoke rim, kept in line by the 120/70 section front – both made from super-grip sports compound. Colours? All black, of course. Or in Triumph’s famous Racing Yellow if you prefer. Strength comes from a micro alloyed high tensile steel frame with an aluminum alloy swing arm incorporating an eccentric chain adjuster. Whatever your riding style you can adjust the suspension to suit. The front forks which feature triple rate springs and the rear mono-shock are both adjustable for pre-load and rebound damping. The 43mm front forks are also adjustable for compression damping. Stopping power is taken care of by two 310mm floating discs and two 4 piston calipers up front, and one 255mm disc and 2 piston calipers at the rear, with a frame mounted torque arm. Wheels are black 3-spoke alloys, 17″ x 3.52″ on the front fitted with a 120/70 ZR17 and, to help you hand on the rear, a 17″ x 5.5″ rim with meaty 180/55 ZR17 rubber. To stay the distance you need strength enough to maintain split-second reactions and you need the stamina to keep going, regardless of the heat. The pressure? It’s always on, but the promise of breaking out into cool air, open space, fills your mind with anticipation. The moment, that moment, when you unleash nearly a hundred horses with one twist of the wrist, brings a whole new meaning to the phrase ‘clocking off.’ It’s sweet release at the end of each shift. So take the long way home and leave the rigors of the day far behind. Don’t say much, don’t need to… Nothing too flashy, just stand there and you’ve made the point. Don’t be heavy handed, a light touch is intimidating enough. Just look and listen. Let others do the talking – they will when they see you – and don’t forget if you need a bit of muscle we’ve got it. All Muscle and stripped for action, the Speed Triple is an awesome sight. 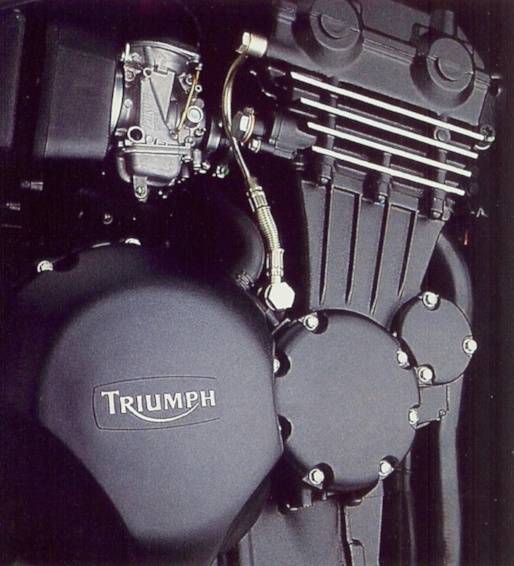 In the style of the classic cafe racer, it packs a mighty punch – close to 100bhp being produced by a 900cc three cylinder engine that’s now linked to a new 6-speed gearbox. The Daytona-derived frame, all new fully-adjustable aluminum rear suspension unit and 180/55 section rear tyre ensure that the power is put down firmly on the tarmac, a fact that has been conclusively proved on the racetrack. In the UK’s Speed Triple Challenge series, near standard road machines, ridden by some of the world’s top racers, have achieved new lap records at two of the UK’s leading circuits, Thruxton and Outlton Park. With the Speed Triple, what you see is what you get – a bike with a very clear sense of purpose.